St Johns ambulance and first aid was immediately in the thick of it in Christchurch and continue to play an essential part in the slow recovery. 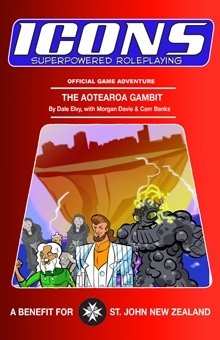 Here’s a neat way to help them: The Aotearoa Gambit a brand new adventure for tabletop superhero RPG ICONS, with all revenue going to St John NZ. Once again Gareth at Adamant was at the heart of the project – this was his idea, and he’s pledged all proceeds from this product in perpetuity to St John. Local legend Dale Elvy wrote it, I did some stat work, and expat Kiwi Cam Banks edited. Non-Kiwi but fine chap ICONS line artist Dan Houser made some incredible illustrations in record time. And it may well be the weirdest fundraiser St John ever had. Fight a Moeraki boulder! See Christchurch’s famous wizard fight crime! Interfere in the filming of a certain fantasy epic involving short hairy-footed folk! It’s a great evening’s worth of RPG fun, and for a good cause. And it’s yours for only $1.99 US! You know what to do! Posted by morgue on Wednesday, March 9, 2011, at 9:04 am. Filed under Uncategorized. Follow any responses to this post with its comments RSS feed. Both comments and trackbacks are currently closed.